The beauty of the FA Cup is that it can throw up some great days out. With the first three rounds all being drawn at the start of the competition, you can start working out the permutations of where you may be watching a game in weeks to come. 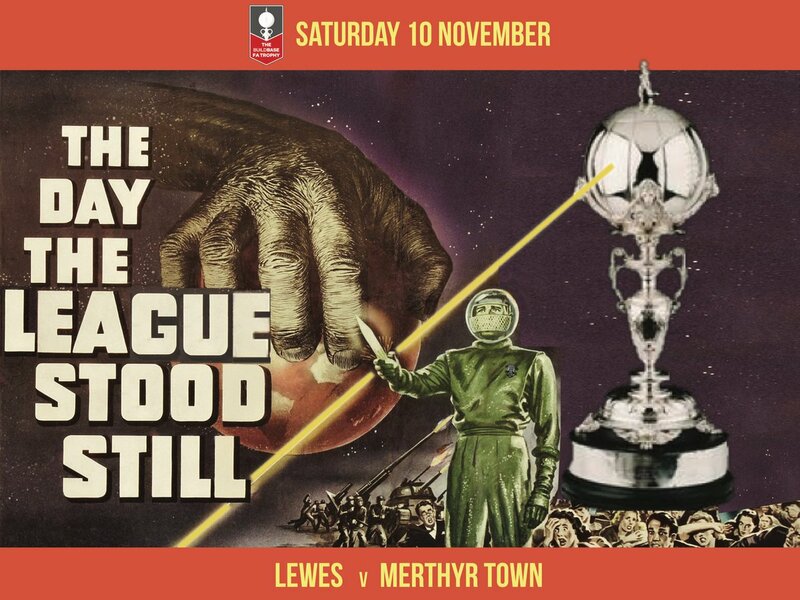 This season Lewes would enter the competition away to Worthing United, Ashford United or Peacehaven and Telscombe, the last of which would be a big local derby for one of the Ryman League’s newest sides. But before then I had a free northern weekend pass to take in a game in the Preliminary Round of the world’s oldest domestic cup competition. A swift look at the fixtures threw up a few options, but one, or should I say two, stood out. Add in the Hors D’oeuvre of a trip to Elland Road for the lunchtime game between Leeds United and Queens Park Rangers and it promised to be a day up there with my wedding and birth of my first-born. So after the final whistle blew at Elland Road I was back in the car, did a right out of Elland Road and headed straight down the A653, under the M1, waving at Dewsbury as I passed and finally taking a left into Owl Lane. I was heading to a point that was almost equidistant between the East and West coasts of England. A town that could call Gail Platt, Black Lace and David Peace (author of Damned United) home; a town that had not one but two breweries in and a town that had two non league teams playing at home in the FA Cup on the same day. Ladies and Gentlemen, welcome to Ossett. What do you mean, where? Ossett, a market town within the boundaries of the City of Wakefield. West Yorkshire, or simply “Up north” to many who live down that there London. The two breweries? 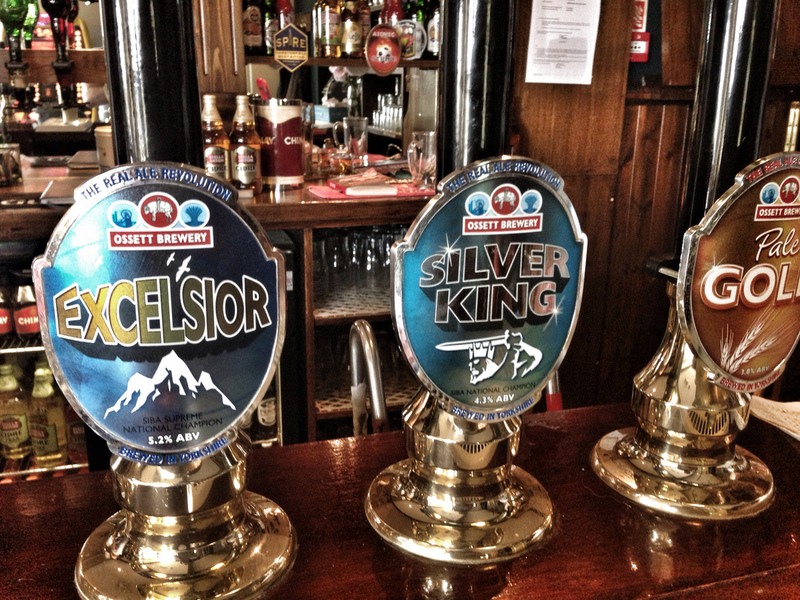 The Ossett Brewery, producer of such delights as Silver King, Big Red and Excelsior is the more traditional beer producer, whilst the new upstart Bob’s Brewery has a stable of beers including Sherunkel, Bidazzler, Slayah and of course Erjob (“Made for sipping with Cheddar Ploughmans Lunch, a smoked mackerel fillet or an England Test victory”). And the football teams? Well, welcome to the biggest rivalry in the Northern Premier League Division One North. There are plenty of cities around Britain that have dual club rivalries. London, Liverpool, Manchester, Nottingham, Dundee. But what about the towns? 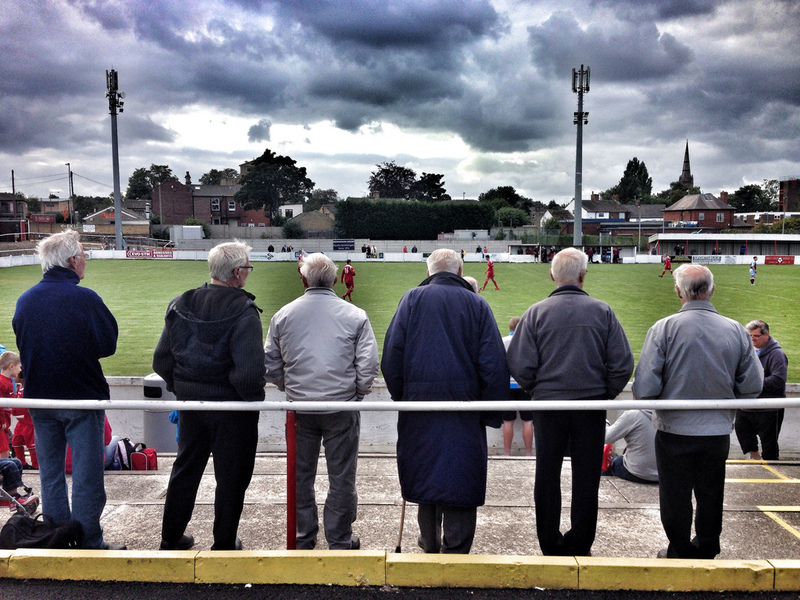 Few have two teams in so the situation in non-league terms in Ossett is quite unique. Two clubs separated by 478 yards across the town centre. It seems amazing that with Emley and Wakefield also within a few minutes drive, the clubs could continue to survive. But survive they do, and for only the third time this season (probably), both Ossett teams would be kicking off at the same time (obviously, the other two are where they play each other!). Initially, it was a case of trying to decide which one to choose for my Road to Wembley. Local football guru and of course, my publisher (I still love saying that), David Hartrick then made a bold suggestion. “A half in each?”. You had me at “. 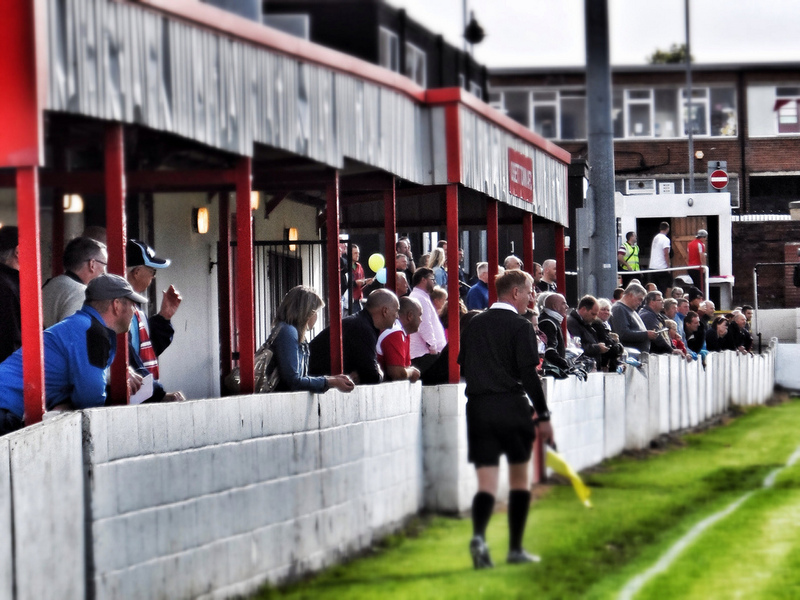 Ossett Albion was drawn first out of the hat and so they would be our venue for the first half of the action, with our pre-match warm up taking place at the famous Ossett Tap, a pub that could boast the whole range of Ossett Brewery beers on draft as well. Of course, the first customer we see come in orders up a Fosters, but it turns out he was from Guildford so his ignorance could be forgiven. Just down the hill from the Tap is Dimplewells, home of The Albion, The Golds, The Unicorns and of course, the Ossett Ultras since 1944. These days the picturesque stadium, with the huge slope, is known as the Warehouse Systems Stadium, of course, but is as rustic today as it was a decade ago when they had their best ever run in the cup, reaching the final qualifying round and beating Ossett Town along the way before defeat to Stalybridge Celtic. The season hasn’t started too kindly for Albion with four defeats from four games but the FA Cup would be a welcome distraction, especially as the visitors, fan-owned Runcorn Linnets, currently ply their trade in the step below Ossett in the North West Counties League. But the cup is a fickle mistress as we all know all too well. Thirty five minutes into this tie and Albion were dead and buried. Two nil down and with centre-back Henry Owen back in the dressing room after a straight red it seemed that The Golds road to Wembley was shut at the first junction. They could hardly complain. They had been outplayed, out shouted, out flagged and out silly-hatted by the visitors from the other side of the Pennines who fully deserved their lead. “Feed the fish and he will score” was the chant from the fifty or so away fans in the tenth minute when Gavin Salmon volleyed Runcorn into the lead in the 10th minute. Dave and I weren’t expecting that. We were still reeling from the 2 (two!) dogs in the ground, the cricket ball that sailed over the wall from the game next door and the huge chip butty that I was trying to eat whilst retaining my modesty. Runcorn were simply “up for it” and they took advantage of some more indecision in the home defence in the 25th minutes when Antony Hickey scored from close range. Then came Owen’s moment of madness. In a game that was littered with swearing both from the players and the dug outs, quite what the Ossett number 4 said to get a straight red is a mystery but he seemed very crest-fallen later on Twitter, apologising for losing his head. There was no further scoring action until the last-minute when Adam “Gerd” Muller headed home after the ball had come back off the bar to give Albion some hope but that lasted all but 47 seconds before Mark Houghton scored a third for the visitors from close range. By this time we were on the other side of the town centre but knew all of this thanks to the live streaming on the game on the internet…..okay, by following it on Twitter. More pictures from Ossett Albion v Runcorn Linnets can be found here. We’d gone all continental on our 8 minutes 23 seconds walk across town to the home of The Reds. Technically the ground is known as Ingfield, but we prefer the story of how it is still known by many as Stade France. The club was formed in 1936, and moved into the town centre ground in 1957. 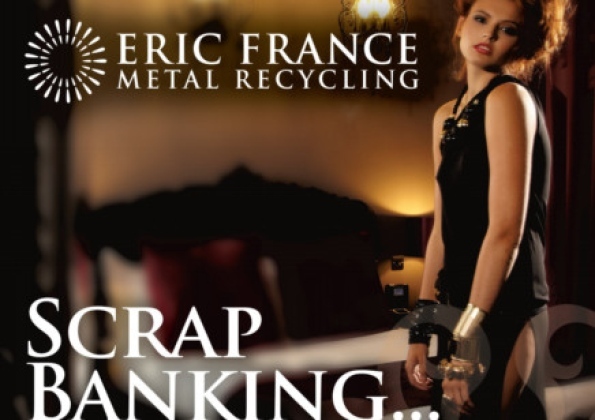 In 2010 the ground was renamed Stade France because of a partnership with Eric France, a local scrap metal company. They were famous for their completely irrelevant adverts featuring scantily-clan women prior to their £20m bankruptcy earlier this year. In 1998, there was a plan to build a sports village on the land next to the M1 off Queens Drive, the plan would have seen Ossett Town get a new ground and share facilities with Wakefield Trinity RLFC and Wakefield RUFC. However, the members of Ossett Town voted against this plan. In 2006, Tesco offered to buy the Stade France site and the plan would entail Ossett Town moving up to Shaw Cross to ground-share with Dewsbury Rams RLFC, but again the members of Ossett Town voted against the plan and you can understand why as the existing stadium is more than adequate for their needs. It was goal less when we arrived, and we thanked the officials for acting on our fax that said “no goals until we arrive please chaps. Champion.” It had been a hard week for Town as they had lost one of their promising summer signings, Chris Walton due to a new job, which meant he couldn’t get the bus to the ground anymore. But the magic of the cup was in town, and what better game than a local derby. AFC Emley, from just 7 miles down the road, had THE ultimate FA Cup tale to tell, one that they are still quite rightly dining out on today. It was the old incarnation of the club who in 1997/98 reached the third round of the FA Cup and drew West Ham United. It was a case of claret and blue as far as the eye could see on a chilly January day as the Non League side played their hearts out, going down to 2-1 to a West Ham side who were 8th in the Premier League at the time and featuring Frank Lampard, Rio Ferdinand and Stuart Pearce. That day seems like a million miles away as the club split in two with one side departing for Wakefield whilst Emley reformed back in their home village and started their long journey back up the Non League ladder. 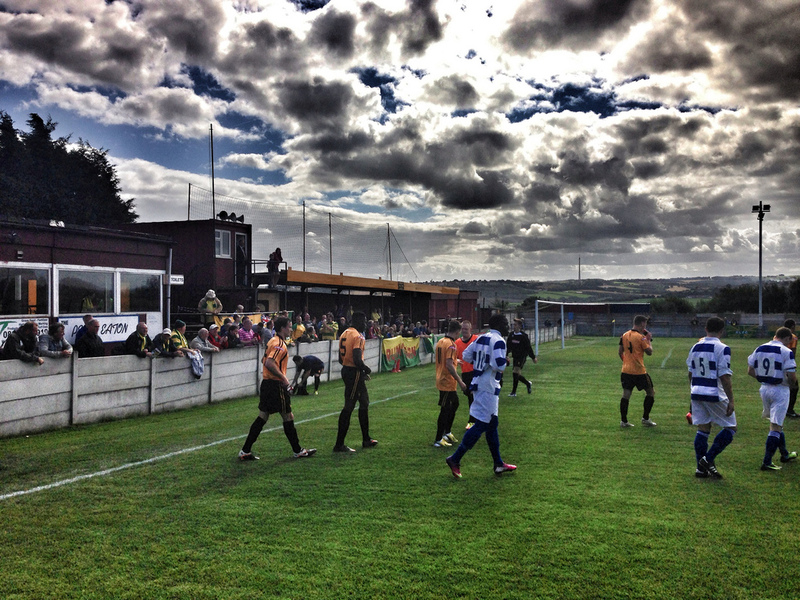 Alas, this year there wasn’t going to be any Cup glory as they were roundly beaten by a strong Ossett Town side. We had just made our way around the ground to behind the goal when Jimmy Eyles pounced on a loose ball in the area after the Emley keeper, making his debut, could only parry a shot. A few minutes later came one of the decisive moments in the game. The Emley keeper, Chris Senior, raced out of his box and made a perfectly well timed tackle on an on-rushing Ossett Town forward. The referee, some 50 yards behind play and with the linesman on the other side of the pitch, somehow saw an offence that nobody else did and gave the keeper a yellow. “He will be pissed if he gets a second yellow now”, said Dave. As if that was likely to happen! With five minutes to go Town made the tie safe when Andrew “Foxy” Fox was brought down in the box, and as eyes focused on the referee to point to the spot, the ball fell to Luke Sharry, who slotted home. The goal celebrations were muted, disrupted by an argument between the Emley players who were trying to lay the finger of blame on each other. We took the goal as our cue to wander back to the exit. As the game was entering injury time the gate that formed the tunnel had been put across the terrace forcing us to walk behind the club house. In the 7 or so seconds we were out of sight of the pitch, Senior had brought down an Ossett player, given away a penalty and been sent off. Without the luxury of a sub keeper on the bench, Emley’s Paul Sykes slipped on the gloves but got nowhere near Eyles penalty that signalled the end of the tie once it hit the back of the next. It would have been rude not to end the day with a final pint in the Tap, opting for a Silver King whilst digesting the results from elsewhere. 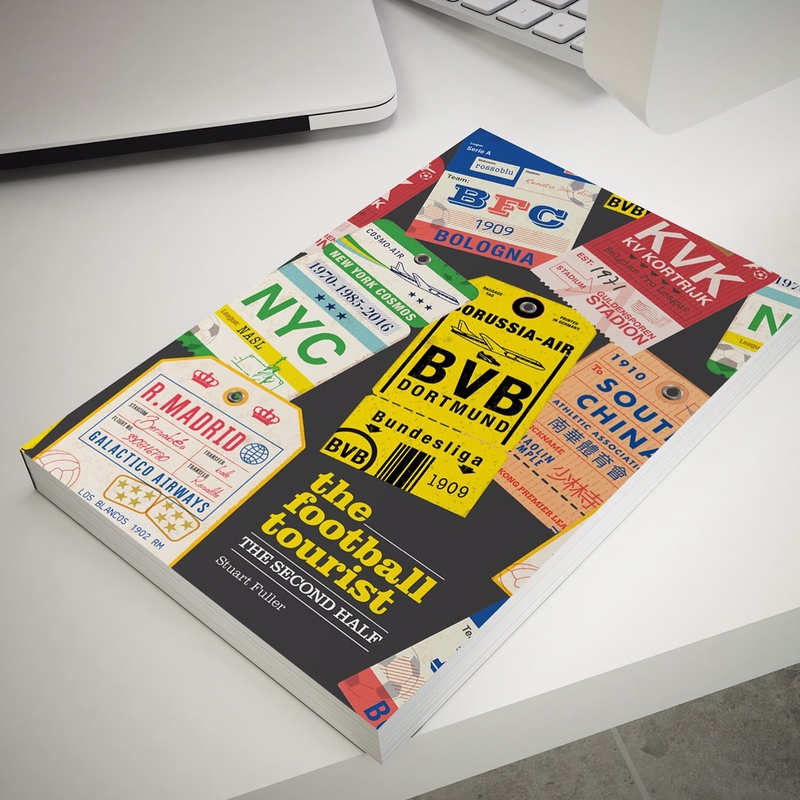 Such had been our love for the game today that we’d completely forgot that the world of football existed outside the small, surreal town of Ossett. More pictures from Ossett Town v AFC Emley can be found here. This entry was posted in FA Cup, Non league football and tagged AFC Emley, FA Cup, Leeds United, Ossett Albion, Ossett Town, Runcorn Linnets. Bookmark the permalink. Sorry mate, I grew up in Dewsbury, and if you turn left into Owl Lane coming from Elland Road, you haven’t reached it yet!